Tender Lamb Chops, Grilled, Served With Spicy Thai Chili, Avocado Salsa. People here usually say “jitna mehnga ho ga khana utna hi bikay ga” and to some extent it is true. I mean we see people literally throwing money away at new restaurants that open which have a high end gourmet menu and plush decor. I do agree with the notion that going out to eat either lunch or dinner should be an experience rather than just a run of the mill drill to eat. If you’re willing to spend and splurge on an opulent gourmet meal it may as well give you an experience rather than just a meal. So what we usually do is take out the time to put on our best attire, either make a reservation or then go out for the perfect dinner. Sometimes you’re in the mood to have the best gourmet food there is and spending more than usual isn’t a huge problem. For us, occasionally having high quality food which provides you a visual, oral and gastronomic treat is always acceptable or is rather welcome to stray away from the insipid taste of home cooked food or even the mundane street food which you have every other day. You need a meal which refines your palate and takes you on a culinary journey whereby you experience new tastes, cuisines and flavours. We all need a respite from home cooked meals and salaans now and then. 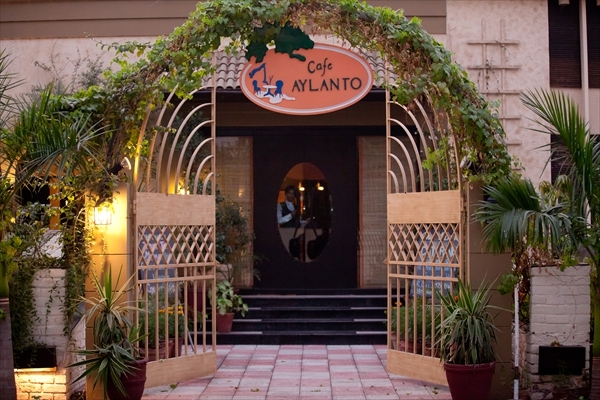 So if you want to have the best fine dining experience with cooking that has finesse and a touch of glamour to it, Cafe Aylanto is the place to go. You can have a proper four course meal beginning from soups, starters, main course and desserts. They have soups like broccoli soups, cream of chicken soup, French onion soup, roasted tomato soup, etc. The starters menu is as splendid as the rest with options like fried chilli calamari, greek chicken salad, baked cheese parcels, pesto chicken salad, chilli mozzarella salad. The litany of pastas on their menu is worth trying. The deliciously smooth sauces combined with different varieties of pastas and protein (meat options) will surely create a symphony of flavours on your taste buds. Their seafood menu infuses an array of oriental spices and herbs to cook meals with techniques which enhances the flavor of the dishes ex: pan fried sea bass, garlic red snapper, oven baked fish and a whole lot more. Their chicken entrees are also a treat for your senses as you get to experience flavours which are new and exciting. They boast a luxuriously flavourful beef and lamb menu with options like grilled beef fillets, pepper steak, etc. Moreover, their brick oven thin crust pizzas give that crunchy bite while giving you the burst of authentic Italian flavours. So we get it, their menu is to die for but then again there are days when you crave to have the best gourmet meal but just don’t want to leave the comfort of your own home. Worry not! Just log onto our website or download our App and place your order. Whatever you want, we deliver!